Photographed in Oklahoma November 19, 2018. Nikon D810, Sigma 24-105 lens, 1/1250 sec at f/6.3, ISO 100. 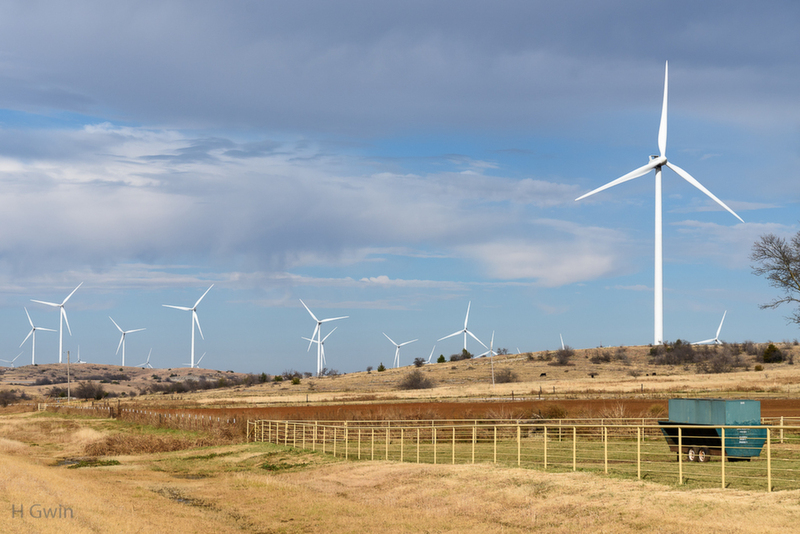 These windmills are popping up all over the place in Texas and Oklahoma. I understand the need for renewable energy, but I do not like to see them pretty much ruin the beauty of the countryside. Also, do not know the impact to wildlife? A good side of these windmills is that they supplement the income of family farms and ranchers, allowing the land to remain in their family, instead of the land being sold to large corporations. Nice illustration of the effect on landscape Gene. So many debatable points with windmills. Would there be oil rigs on the land otherwise, for instance? Some people would think them beautiful....maybe the next generation will take them in stride. I prefer to see solar arrays-still not pretty, but at least (I think) less destructive. These windmills are noisy too! Anyway, a good shot for generating debate! Cynthia, You're probably right about the younger generation. My Son doesn't see anything wrong with them and doesn't mind the way they look. He's also an electrical engineer, maybe that has something to do with it?